A wind farm has been paid £1.2 million not to produce electricity for eight-and-a-half hours. The amount is ten times greater than the wind farm’s owners would have received had they actually generated any electricity. The disclosure exposes the bizarre workings of Britain’s electricity supply, prompting calls last night for an official investigation into the payments system. In total, 11 wind farms were closed down last week, receiving a total of £2.6 million. The money – detailed in calculations provided by National Grid – will be added on to household bills and paid for by consumers. As Britain pushes for more and more wind farms, critics claim the size of the ‘constraint payments’ will grow accordingly – raising serious concern about the long-term suitability of wind power to meet Britain’s energy needs. Crystal Rig’s owners asked for £999 per megawatt hour of energy they would have produced had they been switched on. Incredibly, the figure Crystal Rig had bid was accepted by the National Grid. Had the turbines remained on, Crystal Rig’s owners would have received the going rate of about £100 per megawatt hour instead. Half of that is in the form of a generous consumer subsidy. 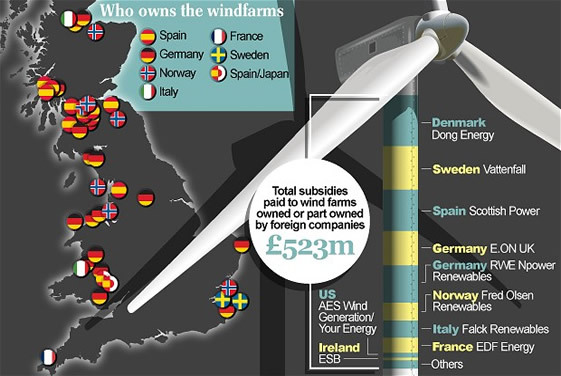 “The very principle of paying wind farm owners for not producing is one that is offensive to consumers,” said Mr Yeo, “It looks like a new version of the Common Agricultural Policy where people are paid not to produce things. The National Grid runs a ‘balancing mechanism’ to ensure electricity supply meets national demand. Electricity cannot be stored. In a further twist, traditional coal- and gas-fired power stations were also running on reduced power last week – but energy companies actually paid the National Grid to do so. That is because the companies made savings by not having to burn as much fossil fuel. Dr John Constable, director of the Renewable Energy Foundation, an energy think tank which spotted the size of the payment at Crystal Rig, said: “This system appears to be unreasonable, is certainly not in the consumer interest, and requires the urgent attention of the regulator, Ofgem. The spokesman said they took the cheapest bids first before being forced to accept the Crystal Rig bid in order “to operate the network safely”. A spokesman for Fred Olsen Renewables said: “Crystal Rig is one of the largest wind farms in the UK so it is one of the last farms we intend to get switched off, so the price is set that high. An Ofgem spokesman said: “We routinely monitor the market and over the past few days we have been looking carefully at the bidding behaviour of generators behind constraints, including wind generators. A spokesman said: “Wind turbines are generating a great deal of clean, green energy ? the problem is that the National Grid simply doesn’t have the capacity to take it all in.